Yesterday was Memorial Day here in the US and I was inspired to dig out my red, white and blue fabrics and work on a patriotic Twilt. As you can see I have collected quite a few batiks in those colors. “Stars & Stripes” went together pretty quickly. Twelve 3D triangles point to a single 3D square offset from the center. I had rejected the muted strip with stars but when I laid it out I changed my mind. 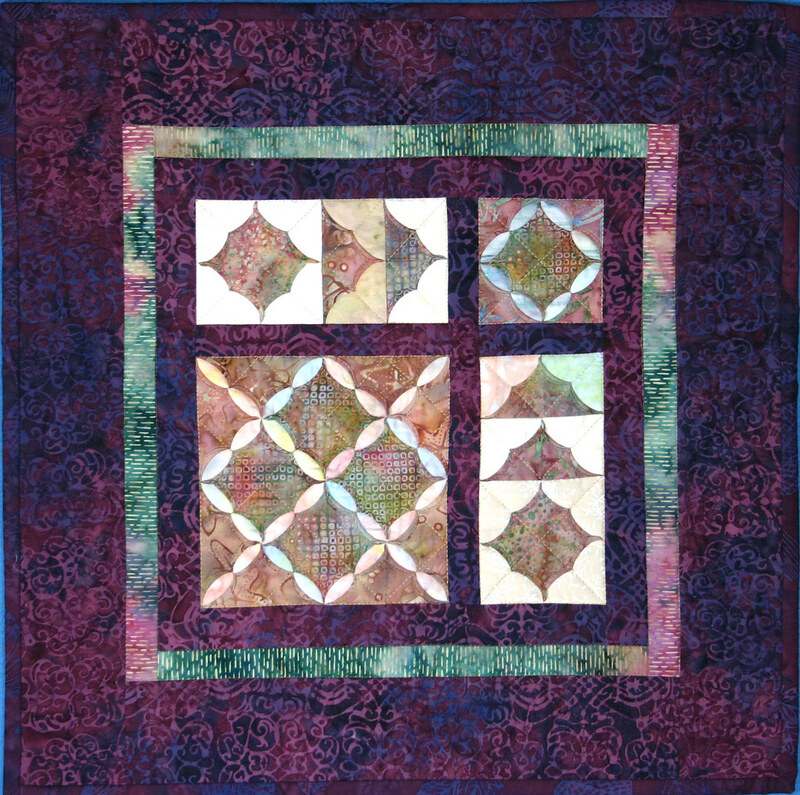 The 3D square and triangles are grid quilted and then the folds are rolled. Straight lines of quilting echo the stripes of the star stripe fabric. What have you been working on? I love to hear. Have you started your own Twilt project. If not, you should give it a try. I am enjoying myself immensely. 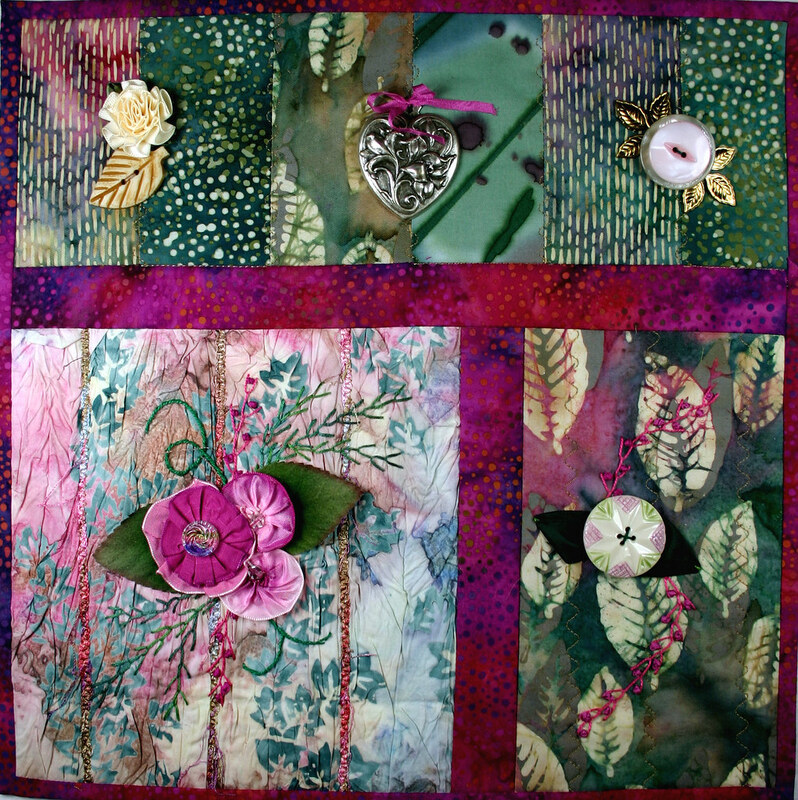 For more info: Twitter quilts…….Twilts or see all my Twilts on my Flickr Twilts Page. As you look at my “May Flowers:” Twilt I am teaching a workshop in La Habra, California and set this to post automatically. Here’s hoping it worked. 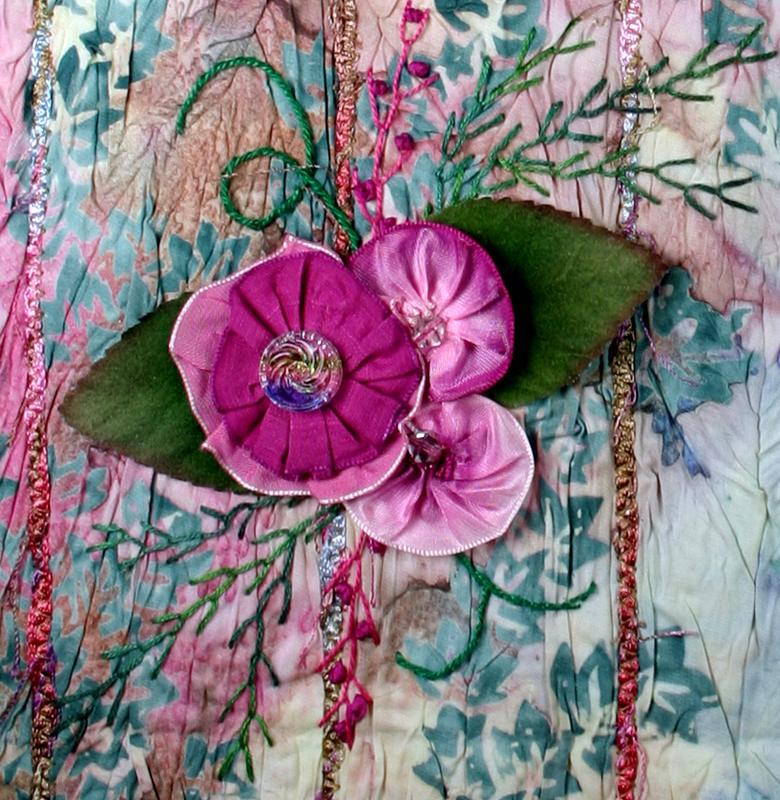 I did a bit of embroidery on this piece with floss, pearl cotton, silk ribbon and some wire edge ribbon flowers and leaves. I added buttons, leaves and a charm. The base for the larger square is crinkled batik with a few couched threads. I will probably go back and add some beads and silk ribbon leaves since I had to focus on my Lecture and Workshop. Please send me links and pictures when you finally get around to making your own Twilt. For more info on Twilts: Twitter Quilts…….Twilts. You can also see all my Twilts on my Flickr Twilts Page. I went back to the early days of my process to create “Starlit Night”. 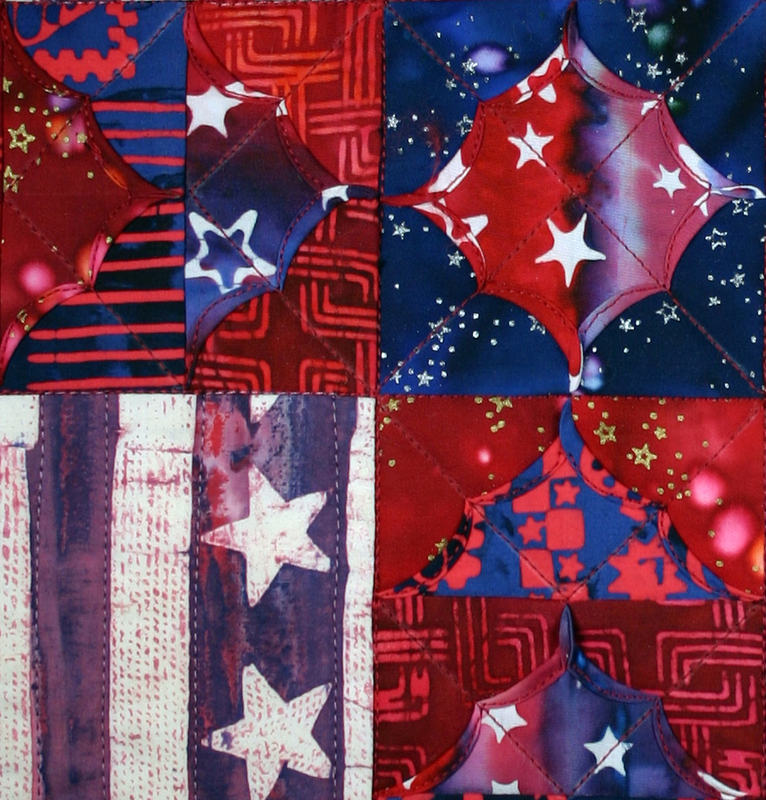 The larger star in this piece is a Floating Star block from my second book, “Machine Stitched Cathedral Stars“. I shrunk the block and used a grid of 1” background squares. The smaller stars are miniature versions of Star Puzzle. I love the strong constrast created with gold prints and dark star prints. 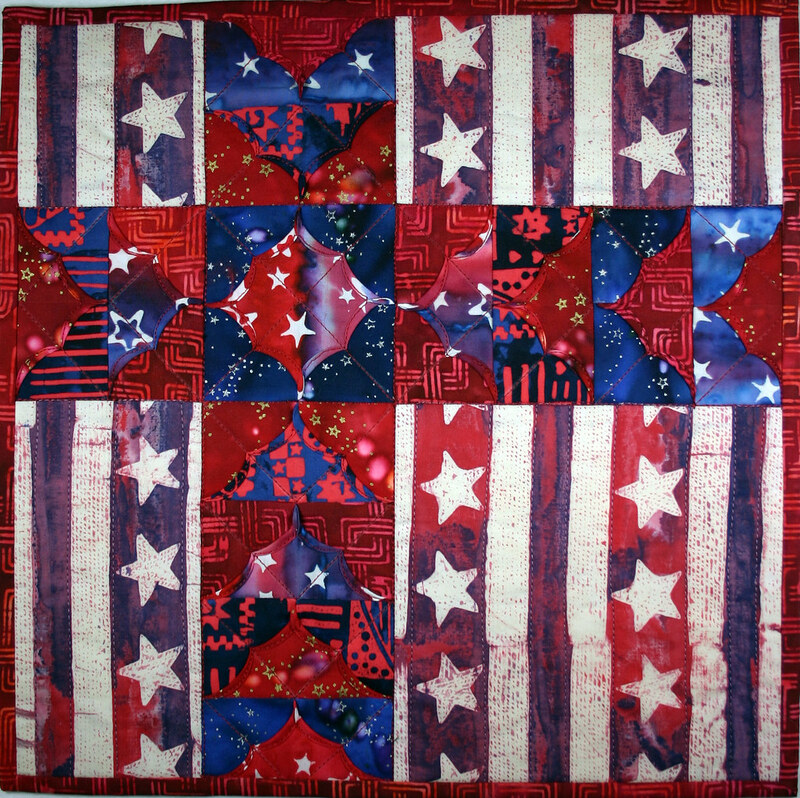 Machine quilted stars and a few Hot Stick crystals on the background add to the celestial feel. The border print is an older Batik from the early 90’s, I think. I enjoy digging through my fabric collection and finding the older pieces. Twilts are the perfect place to finally use these fabrics. I am considering offering patterns for some of the Twilts so if there’s one you really like let me know. I had a quiet Mother’s day, heard from all my kids and got flowers which I will probably enjoy for quite a few more days. I did get out and walk this morning. It feels a little like the mountains here in the foothills of Banning. My class for the Piecmakers quilt group went quite well and I really appreciate Dianne Thayer setting it all up. I introduced a new project, The Cathedral Window Sampler. The ladies did very well! So, it’s time to get to work on tomorrow’s Twilt! 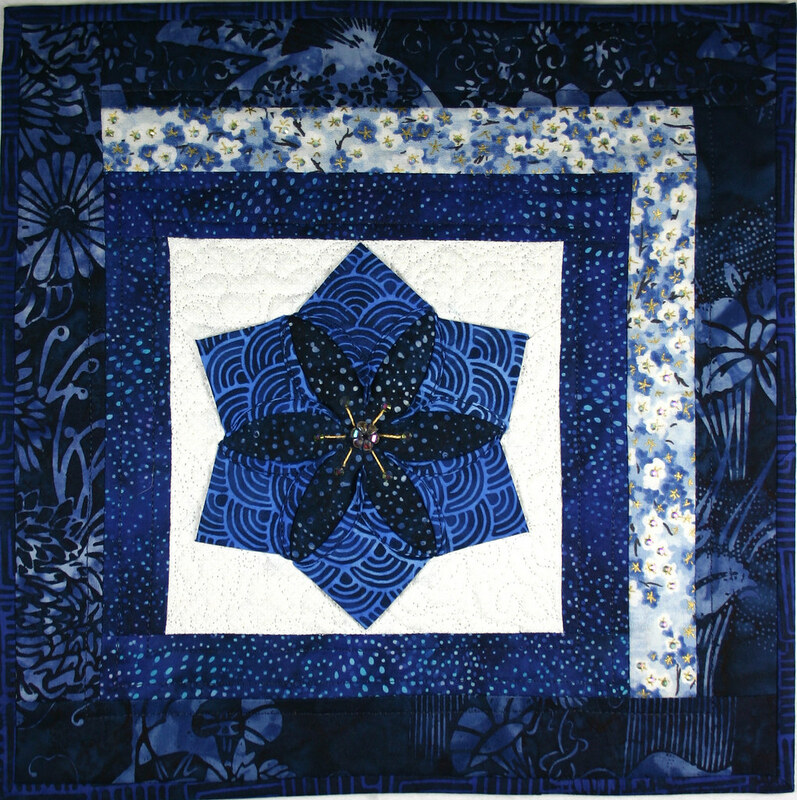 A while back I made a quilt called “A Blue Bouquet for Barbara Jean”. It was a quilt I made in memory of my mother who passed away when I was very young. 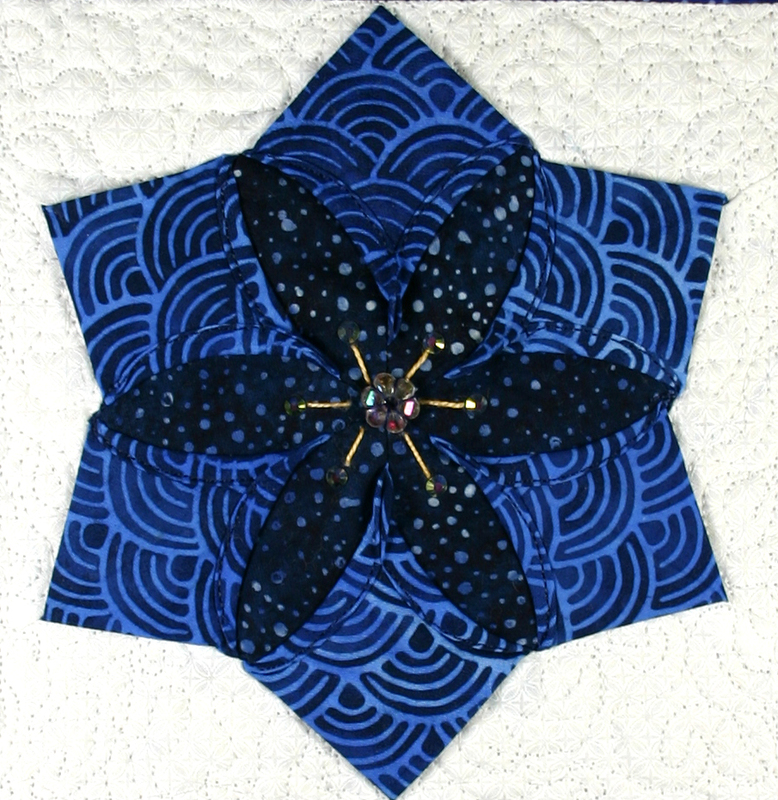 This little Twilt, “Blue Bouquet”, uses the same 3D flower block but has only six petals where the blocks in the larger quilt each had eight petals. I added hot stick Crystals in the light flower print inset and in the center of the 3D flower as well as a bead and embroidery. The fabrics are several different blue batiks except for the inset fabric. 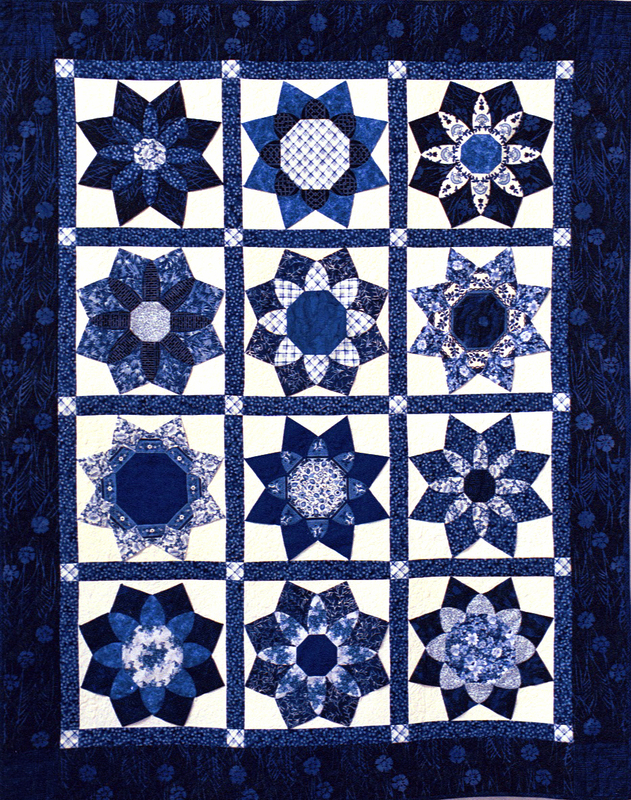 I love blue and white quilts and I think I am not alone. The inspiration for the Twilt, “A Blue Bouquet for Barbara Jean”. For more information on Twitter Quilts…..Twilts. The last two weekends have been busy for me April 25 and 26 I was at the Seven Sisters Quilt Show in San Luis Obispo, California. I have family up there so I was able to see family as well as enjoy seeing old friends and meeting new ones. Patricia Corley had a quilt in the show, “Butterflies”, that she made in a Machine Stitched Cathedral Stars class that I taught a few years ago and you know how I love to see student work. This last weekend May 1 and 2 I was at the Inland Empire Quilt Show in Norco, California. 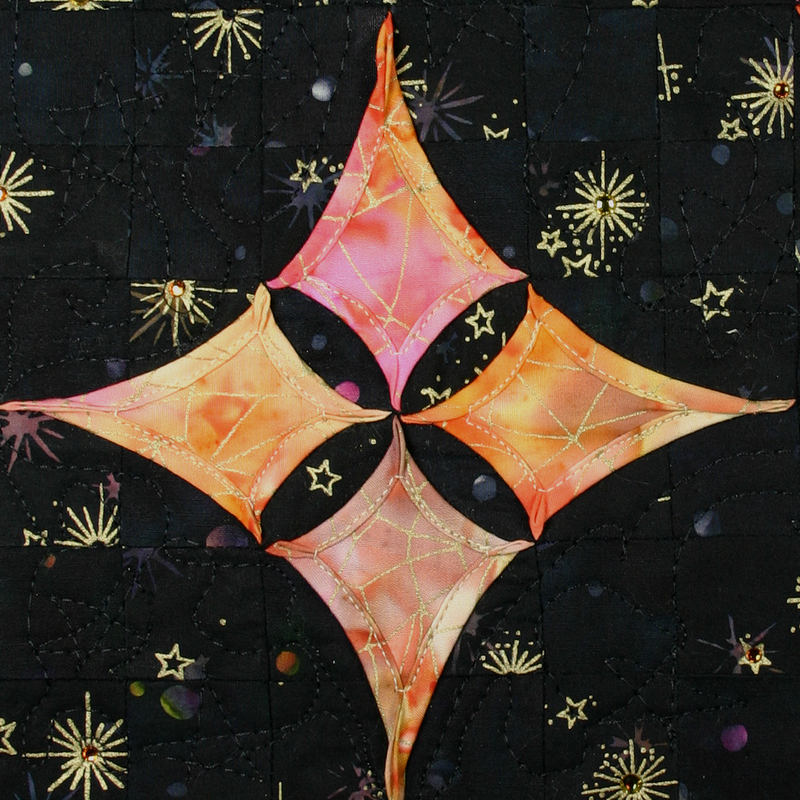 There were a lot of wonderful quilts in the show and another student’s work, Jeanie Stellrecht’s “Cathedral Star”. Jeanie was in a Cathedral Window Stars Table Runner class I taught at The Fabric Patch. Vending at quilt shows is quite a bit of work but I always enjoy visiting with quilters, vendors and friends!